Aim. Development of mathematical model for process of teeth profiling of spur helical gear by disk cutting tool by the radial and round kinematic modify formation method on the basis conception of forming of teeth flanks by spatial helix coaxial formative lines. Method. Researches are based on methods and substantive provisions of the theory of parts surfaces formation by cutting instruments, in particular formation of spur gear teeth, the tooth system theory, kinematics analysis, analytical and differential geometry. Results. The design of formation process of surfaces of teeth of cylindrical helical wheels is conducted by disk milling cutters by the new method of formation at the continuous rotation of the cut gear. It is suggested to carry out gear cutting with a kinematics changeable angular velocity with the rotation of eccentric arbor with the set disk milling cutter that provides the receipt of wheels teeth with necessary thickness. The systems of equalizations of helix formative coaxial lines and equalizations of spatial tooth flanks of spur helical gears are got. Scientific novelty. Bases of profiling of teeth surfaces of spur helical gear are worked out by the radial and round kinematic modify formation method. Profiling of teeth sides is executed true spiral coaxial by formative lines. The necessity of profiling of teeth surfaces of helical wheels is set due to the kinematics change of angular velocity of appeal of instrument. The correlations got in theory complement theoretical positions of formation of surfaces of details cutting instruments and them technological providing. It is offered at the synthesis of teeth surfaces of sine-similar profile of the increased loading ability complex to combine kinematics, geometrical responses of hooking and technological parameter of gear cutting process. Practical significance. The design of process of forming of teeth surfaces of cylindrical helical wheels will provide rational practical application of the radial and round kinematic modify formation method for making of large module of cylindrical gear-wheels of gearing of transport vehicles due to the increase of the productivity of treatment at the receipt of surfaces of teeth with modified relatively by a involute profile that forecast diminishes the dynamic loading in hooking and assists the decline of sound-level in a transmission.
. Antoniuk V.E. Sovremennyye tekhnolohyy yzghotovlenyia tsylyndrycheskykh zubchatykh koles / V.E. Antoniuk // Oborudovanye y ynstrument dlia professyonalov. Seryia - metalloobrabotka – 2007. №4. S. 6-18.
. Loktev D.A. Ratsyonalnaia эkspluatatsyia sovremennykh cherviachnykh frez / D.A. Loktev // Oborudovanye y ynstrument dlia professyonalov. Seryia - metalloobrabotka – 2007. №4. S. 20-23.
. Okhrimenko O.A. Zahalni osnovy teorii proektuvannia cherviachnykh frez / O.A.Okhrimenko. // Avtoref dys. … dok. tekhn. nauk. 05.03.01 – Kyiv. -2015. – 44 s.
. Anykyn Yu.V. Synusoydalnoe zatseplenye: osnovy heometro-kynematycheskoi teoryy / Yu.V. Anykyn. – Voronezh: Yzd-vo Voronezhskoho un-ta, 1975 . – 63 s.
. Tkach P.M. Vyznachennia mozhlyvosti profiliuvannia vykhidnykh konturiv tsylindrychnykh priamozubykh peredach kryvymy druhoho poriadku / P.M. Tkach // Visnyk NTU "KhPI". Seriia: Problemy mekha-nichnoho pryvodu. – Kh. : NTU "KhPI", 2015. – № 34. – S. 135–144.
. Tkach P.M. Vyrobna poverkhnia ta verstatne zacheplennia tsylindrychnykh priamozubykh synusoidalnykh peredach / P.M. Tkach // VisnykNTUU "KPI". Seriia: Mashynobuduvannia. – K. : NTUU "KPI", 2014, – № 1 (70). – S. 112–121.
. Tkach P.M. Poperednia otsinka zghynalnoi mitsnosti priamoho zuba z synusoidalnym profilem / P.M. Tkach // Visnyk Skhidnoukrainskoho natsionalnoho universytetu imeni Volodymyra Dalia. – Luhansk :vyd-vo SNU im. V. Dalia, 2014. – № 4(211). – Ch. 1. – S. 236–241.
. Tkach P.M. Yakisni pokaznyky pratsezdatnosti synusoidalnykh tsylindrychnykh priamozubykh peredach / P.M. Tkach, P.L. Nosko, P.V. Fil, O.O. Reviakina // Visnyk NTU "KhPI". Seriia: Problemy mekhanichnoho pryvodu. – № 25 (1247): – Kharkiv, NTU "KhPI", 2017.– S. 135–139.
. Kryvosheia A.V. Perspektyvy prymenenyia tverdosplavnykh otreznykh dyskovykh frez pry obrabotke tsylyndrycheskykh zubchatykh koles / A.V. Kryvosheia., Yu.M. Danylchenko, V.E. Melnyk., Э.M. Blahut. // Rezanye y ynstrument v tekhnolohycheskykh systemakh: Mezhd. nauchn.- tekhn. sbornyk. – Kharkov: NTU “KhPY”, 2005. – Vyp.69. – S. 115-120.
. Danylchenko Yu.M. Kinematyka formoutvorennia tsylindrychnykh zubchastykh kolis z zada-nym profilem dyskovym instrumentom / Yu.M. Danylchenko, A.V. Kryvosheia, S.I. Pasternak, Ye.V. Korotkyi // Visnyk Natsionalnoho Tekhnichnoho Universytetu Ukrainy “ KPI ”. Mashynobuduvannia. – 2005. – № 46. – S. 104-108.
. Danylchenko Yu.M. Matematychne modeliuvannia zakoniv rukhu dyskovoho instrumentu pry obrobtsi zubchastykh kolis dovilnoho profiliu / Yu.M. Danylchenko, A.V. Kryvosheia, S.I. Pasternak // Visnyk Natsionalnoho Tekhnichnoho Universytetu Ukrainy “ KPI ”. Mashynobuduvannia. – 2006. – № 49. – S. 112-118.
. Danylchenko Yu. M. Produktyvnist konturnoi obrobky zubchastykh lanok dyskovym in-strumentom. / Yu. M. Danylchenko, S. I. Pasternak, A. V. Kryvosheia // Visnyk Natsionalnoho Tekh-nichnoho Universytetu Ukrainy "KPI". Mashynobuduvannia. – 2008. - № 53. S. 215-225.
. Pasternak S.I., Danylchenko Yu.M., Storchak M.H., Kryvosheia A.V. Eksperymentalne do-slidzhennia konturnoi obrobky tsylindrychnykh zubchastykh kolis dyskovym instrumentom. / S.I. Paste-rnak, Yu.M. Danylchenko, M.H. Storchak, A.V. Kryvosheia // Visnyk Natsionalnoho Tekhnichnoho Uni-versytetu Ukrainy "KhPI". Tematychnyi vypusk "Problemy mekhanichnoho pryvodu", Kharkiv: NTU "KhPI". – 2010. - № 26. - S. 94-101.
. Pasternak S., Danylchenko Yu., Heisel U. Machining strategies for gear cutting with disc shaped milling tools / S. Pasternak, Yu. Danylchenko., U. Heisel U // Visnyk Natsionalnoho Tekhnichno-ho Universytetu Ukrainy «KPI». Seriia mashynobuduvannia №2 (74). – 2015. - C. 61 – 66.
. Hromnyuk S.I. Tekhnolohichne zabezpechennia yakosti narizannia zubchastykh kolis radialno-kolovym sposobom / S.I. Hromnyuk // Avtoref. dys. kand.tekhn. nauk. 05.02.08. – Lviv. 2016. 25 s.
. Hromnyuk S.I. Rozshyrennia tekhnolohichnykh mozhlyvostei universalnykh zubofrezernykh universalnykh verstativ vvedenniam kerovanoho pryvodu holovnoho rukhu / S.I. Hromnyuk // «Tekhno-lohichnyi audyt ta rezervy vyrobnytstva». – Kharkiv. - 2014. – №5/3(19). 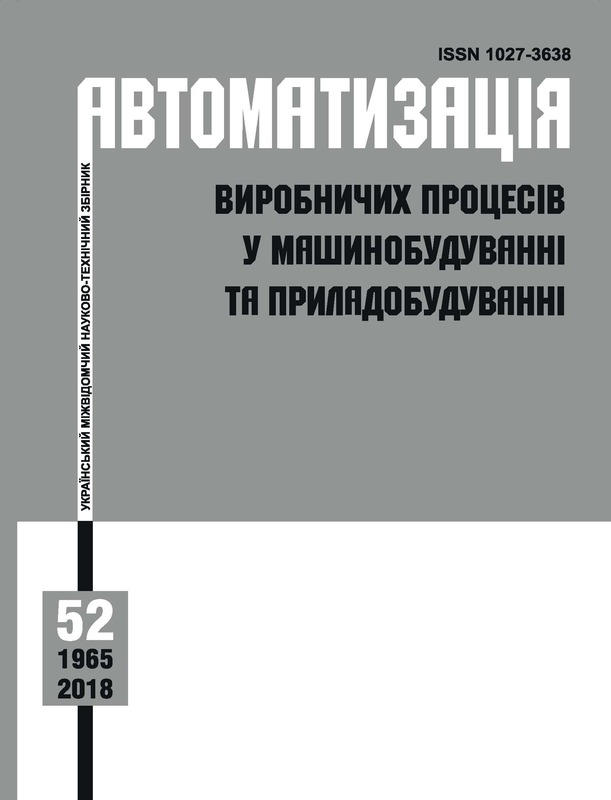 - S.23-27.
. Hrytsay I. Sine-type gearing transmission as the alternative to the conventional ones and the new method of their production / І.Hrytsay, Y.Lytvynyak, L.Bordyuk, S.Hromnyuk // Zeszyty Naukowe PWZS. - Sanok. - 2014. - P.53-63.
. Gromnyuk S.I. Modelyuvannya skladovyx sumarnoyi poxybky i tochnosti zubchastyx kolis v radialno-kolovomu sposobi zubonarizannya / S.I. Gromnyuk, I.Ye. Hrytsay // Visnyk NTU «Xarkivskyj politexnichyj instytut». Seriya: «Problemy mexanichnogo pryvodu». – Xarkiv, NTU «XPI». - 2014. - № 31 (1074): – S.24-28.
. Hrytsay I.Ye. Parametry poperechnogo pererizu zriziv v radialno-obkochuvalnomu sposobi narizannya zubchastyx kolis z osovoyu podacheyu / I.Ye.Hrytsay, S.I.Gromnyuk, A.M.Kuk // Visnyk NU "Lvivska politexnika». Seriya: «Optymizaciya vyrobnychyh procesiv i tehn. kontrol u mashynobuduvanni ta pryladobuduvanni». – Lviv. Vyd-vo NU «LP». - 2014. - № 772. - S.8-14.
. Hrytsay I.Ye. Texnologichne zabezpechennya tochnosti ta bezvidmovnosti procesu narizannya zubchastyx kolis radialno-kolovym sposobom z uraxuvannyam diyi dynamichnyx chynnykiv / I.Ye. Hrytsay, S.I. Gromnyuk // Avtomatyzaciya vyrobnychyh procesiv u mashynobuduvanni ta pryladobuduvanni. Lviv. - 2015. - Vyp. 49. - S. 91-97.
. Lytvyniak Ya.M. Narizannya zubciv zubchastyx kolis zadanogo profilyu dyskovym instrumen-tom za dopomogoyu kopiyuvalnogo prystroyu sposobom radialno-kolovogo formoutvorennya / Ya.M. Lytvyniak // Visnyk Nacionalnogo universytetu «Lvivska politexnika» № 701: Dynamika, micz-nist ta proektuvannya mashyn i pryladiv. – Lviv: Vydavnycztvo Lvivskoyi politexniky. 2011. - S.61-69.
. Lytvyniak Ya.M. Modelyuvannya procesiv otrymannya vypuklo-vvignutyx zubciv cylindrych-nyx kolis metodamy obkatu ta radialno-kolovogo formoutvorennya. / Ya.M. Lytvyniak // Visnyk Na-cionalnogo universytetu «Lvivska politexnika» № 730: Dynamika, micznist ta proektuvannya mashyn i pryladiv. – Lviv: Vydavnycztvo Lvivskoi politehniky. 2012. S. 57–64.
. Lytvyniak Ya.M. Zabezpechennya texnologichnoyi gnuchkosti operacij zubonarizannya v avtomaty-zovanomu vyrobnycztvi cylindrychnyx zubchastyx kolis pidvyshhenoyi navantazhuvalnoyi zdatnosti iz za-stosuvannyam procesu radialno-kolovogo profilyuvannya zubciv / Ya.M. Lytvyniak // Avtomatyzaciya vyrobnychyh procesiv v mashynobuduvanni ta pryladobuduvanni: Ukrayinskyj mizhvidomchyj naukovo-texnichnyj zbirnyk: Vyp. 46: – Lviv: Vydavnycztvo Lvivskoi politehniky. 2012. – S. 135 – 140.
. Lytvyniak Ya.M. Kinematychni osoblyvosti procesu radialno-kolovogo formoutvorennya zubciv cylindrychnyx kolis. / Ya.M. Lytvyniak // Visnyk Nacionalnogo universytetu «Lvivska po-litexnika» № 760: Optymizaciya vyrobnychyh procesiv i tehnichnyj kontrol u mashynobuduvanni ta pryladobuduvanni. – Lviv: Vydavnycztvo Lvivskoi politehniky. 2013. – S. 19–25.
. Lytvyniak Ya.M. Modelyuvannya procesu bezperervnogo formoutvorennya dyskovymy fre-zamy zubciv z modyfikovanym profilem u pryamozubyx zubchastyx kolesax. / Ya.M. Lytvyniak // Visnyk Nacionalnogo universytetu «Lvivska politexnika». Zbirnyk naukovyh pracz № 866: Dynamika, micznist ta proektuvannya mashyn i pryladiv. – Lviv: Vydavnycztvo Lvivskoi politehniky. 2017. – – S. 54–61.